Inside this plain brown wrapping is packaged what may be pound-for-pound the most lethal predator of the feline family. She is the Plain Jane of the world’s big cats, and even the puma’s latin epithet, concolor, meaning “uniform color,” suggests a dress of khaki fatigues. No splashy rosettes of the jaguar for her; she wears a tawny brown fur with a creamy white underside, her only modest adornment the black tinges she sports on her muzzle, ears and tip of her tail. With a long, lean and muscular body, her head seems too small for her torso, her legs too stocky, and her long, thick tail a final attempt to balance out the whole ensemble. Inside this plain brown wrapping is packaged what may be pound-for-pound the most lethal predator of the feline family. Accomplished hunters, pumas utilize their highly developed senses, along with stealth, stability, speed and strength, to stalk and kill prey up to five times their weight. While local pumas primarily feed on deer (making a kill every 7 to 10 days) they are opportunistic hunters, and will also prey on javelina, rabbits, and rodents. Training to hunt for the female’s litter of 2 to 4 cubs starts around 6 months of age, and continues about a year. When full grown, females typically weigh 80 to 100 pounds, and males 120 to 150 pounds. 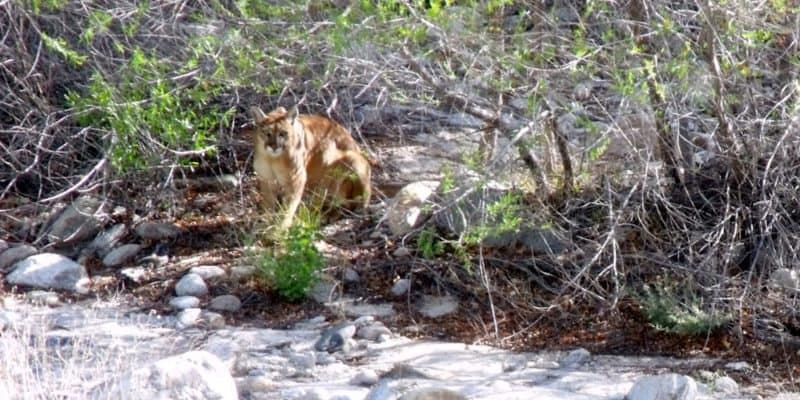 Sabino Canyon and the surrounding canyons and mountains are prime puma territory, providing ample cover and prey for up to four resident cats. Females establish a home range of 50 square miles or more, which may partially overlap other female puma’s home ranges, and be fully engulfed by the male puma’s larger territory of up to 200 square miles, which he fiercely defends against other males. Pumas may live up to 12 years, but a typical lifespan is just 6 years; playing the top predator is a perilous role. It is also a very essential role in a healthy ecosystem; where puma populations decline, deer populations burgeon, resulting in overgrazing, soil erosion, and loss of habitat for many effected species. This photograph was taken along the Bluff Trail in Sabino Canyon.